Breathe: A Green Lung is an installation reflecting upon the important interactions between people and plants that are essential for creating healthier liveable cities. The lack of clean air has become an increasingly recognised problem in urban areas and one of the ways of addressing it has been through using plants. Living walls are simple technical solutions that allow plants to perform functions such as trapping fine particulate matter and purifying the air by absorbing carbon dioxide through their root systems. Highlighting these processes the installation features an outer structure created by two living walls forming a triangular enclosure, with gaps in the walls providing vantage points to view inside. Inside the enclosure is a rock strewn landscape in the centre of which stands a greenhouse, an everyday structure used for generating life and symbolising growth, nurture and our symbiotic relationship with plants. The prosaic character of the structure has been elevated into something sacred with the addition of stained glass windows giving it a cathedral-like appearance. 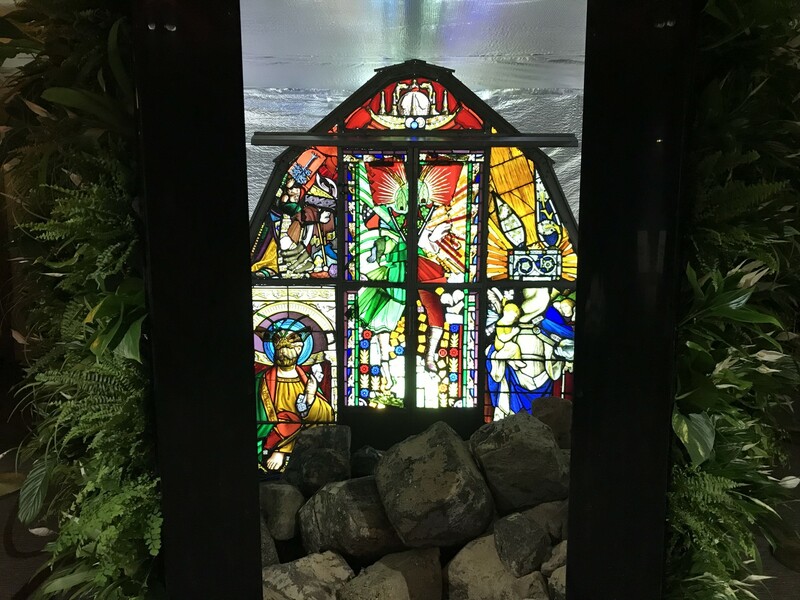 The glass has been reclaimed from churches and reconfigured by Heywood & Condie into new iconic images blending natural and human forms, reflecting upon our interdependence and the ways in which we need to reassess our relationship with nature. Lights inside the greenhouse illuminate the windows and radiate out. Silver-lined interior walls reflect the light and bounce it out through the gaps in the walls and ceiling. Also inside the greenhouse, a dynamic sound piece by Darryl Moore featuring breathing sounds, vacillating between meditative drone-like passages and crescendos, provides it with the suggestion that it contains an animated life force, and reinforces the importance of clean air to our lives. Construction from Treebox by Biotecture. Heywood & Condie are represented by Vigo Gallery, London. With thanks to the Royal Horticultural Society for helping to initiate the project.